Its nearly Christmas – the season of goodwill, so what better way to celebrate than getting a gift for free? To celebrate the continuing success of their massive promotion of 0% commission on football until April 1st & the serious liquidity available in their betting markets, Matchbook are offering Smart Betting Club newsletter readers the chance to win a £200 free bet! Simply register, deposit and bet on any of this weekend’s events using the brand new Matchbook platform and you will be entered into a draw at random to win the £200 bet courtesy of Matchbook. You can also enter on mobile using the new Matchbook iPhone app and bet on this weekend’s football on the move. Entrants must register, deposit & bet £20 stake to qualify for inclusion in the draw. Winner will be chosen at random from qualifying entrants. Bets must be placed on any sporting event settled on Fri 20th, Sat 21st or Sun 22nd of Dec. Closing date for entry to the competition is Sunday 22nd Dec at 11.59pm. Offer is open to any users who registered through the Smart Betting Club link as part of the 0% commission on football offer from the 2nd of Dec.
Offer applies to customers in the following countries only: United Kingdom, Ireland, Australia, Austria, Canada, Croatia, Denmark, Finland, Germany, Greece, Hungary, Italy, Japan, Netherlands, Slovenia, Spain, Sweden, Switzerland. The maximum free bet that will be awarded is £200, bet must be placed on one bet at odds of 1.5 or greater. Funds must be risked and cannot be bet against your own account. Similarly, void bets do not qualify for this offer. Only one free bet offer per household, IP address or device. Offer applies to users of the www.matchbook.com interface only. The promoter of this offer is Triplebet Limited, and players are subject to – Matchbook’s general Terms and Conditions. In the event of any dispute, Triplebet’s decision is final in all matters. Normal KYC rules apply for all accounts. Triplebet Limited reserves the right to amend these Terms and Conditions or terminate this promotion at any time. 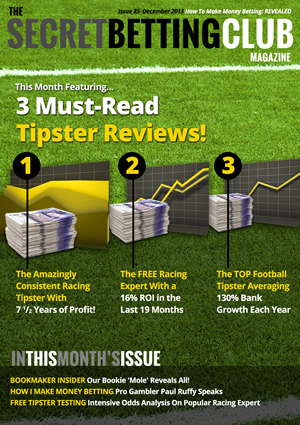 3 Profitable Tipsters You Must Check Out – Latest SBC Mag Reveals All! The very latest Smart Betting Club magazine (Issue 85) is out now and is an absolute must-read for those of you keen to find more on what makes money betting. You can pick up your copy of the latest magazine, the instant you join the Smart Betting Club. That’s not all though because as an SBC member you will also gain access to our huge 7 1/2 year back catalogue full of tipster reviews, expert interviews and guides, betting systems and profitable betting advice. The great news is that all of this is available for the equivalent of just 22p per day and comes with a full money back guarantee if not in any way satisfied once you joined. We are that confident you will love this service! Sign-up for the Smart Betting Club and get started right away! As the old saying goes…’Keep Your Friends Close..And Your Enemies Closer’ and this is certainly the case for us gamblers when it comes to dealing with bookmakers. After all there is only ever really one winner in the battle between bookie and punter. Either we win and they lose or woe betide…they win and we lose. There is no middle-ground. So as part of this quest to understand our rival, we have once again gone behind enemy lines and grabbed an exclusive interview with another ‘bookmaking mole’ who was happy to spill the beans on what really goes on behind the scenes. It’s part of a full feature available in the latest SBC Magazine and to whet your appetite I have a few extracts to share with you today. So far this season, this Fink Tank Football System has made a £2,427.50 profit at £25 stakes if following it in across the top 4 English Leagues (correct as of 1st December 2013). …And this weekend just gone, in the Premier League alone it highlighted some big priced winners such as Newcastle, Crystal Palace, Norwich & Stoke. A simple £25 on each of its Premier League picks would have netted you an extra £317.75 profit. Best of all, we are giving this amazing system away totally for FREE to anyone who wants a copy in our special guide. Within this you can also read about results this system has achieved historically (featuring results data going back more than 5 years) and also for the current 2013/14 season. Believe me, this is one freebie you won’t want to miss out on! It’s fair to say there can be nothing more frustrating when betting on football than backing a team at a big price you fancy to do well, only to see them pegged back by a late equaliser. After all, it can be the difference sometimes between losing the bet entirely or a 10/1 winner, with no middle-ground for ‘nearly being right’. Imagine being a punter with a 12/1 bet on West Brom to beat Chelsea a few weeks back – that sickener of a last-min dubious penalty for the home team will have cost you big time! It’s a similar concept to that of last week where I tackled the age-old racing question of each-way or win only bets. The good news is just like as racing punters we can hedge our bets and go each-way, so too can we with football betting thanks to the Draw No Bets markets, which when done right, can actually be quite lucrative. This is despite the very strong bias we have seen of home football sides winning so far this season, and so we only expect the profits to improve further in coming months. If you are not yet following the Fink Tank System, you can now download an updated version of our Free Guide, which explains the rules behind how it works. You can also read about the results this Basic System has achieved historically (featuring results data going back more than 5 years) and also for the current 2013/14 season.